The Aftermath (2019) is a beautiful, poignant period film set in the aftermath of the Second World War in war ravaged Hamburg, Germany circa 1945 following the defeat and collapse of Nazi Germany. The film is directed by James Kent and the screenplay is based on the book of the same name by novelist Rhidian Brook. It features a stellar cast including Alexander Skarsgard, one of Hollywood’s most sexiest and handsome leading men playing Stefan Lubert, a German architect and widower, and Kiera Knightley, one of the world’s most beautiful women playing Rachael Morgan, Captain Lewis Morgan’s neglected wife and a bereaved mother. The talented and multi-faceted actor Jason Clarke plays Captain Lewis Morgan, and Flora Thiemann stars as Stefan’s troubled daughter Freda. Captain Lewis Morgan and his wife Rachael are re-united in Hamburg, Germany, following the war, and rather live on their own, share their new domicile with its previous occupants, Stefan Lubert and his teenage daughter Freda which shines a light on the complex relationship and socio-political dynamics between victor and vanquished. The perspective of victor and vanquished are encapsulated in the roles of Stefan Lubert, Freda Lubert, Rachael Morgan, and Captain Lewis Morgan. I am immensely fond of melodramas and the narrative of the film delivers in droves. The motif of grief and nostalgia weaves itself through the film giving it depth and structure as does situating marital infidelity in a war ravaged setting. It was mesmerizing to watch the social awkwardness and distaste between Rachael and Stefan give way to a passionate love in the aftermath of war set in the requisitioned beautiful mansion in its idyllic setting and landscaped grounds haunted by the past and the spirit of Claudia Lubert. Of course, the storyline is helped immensely by having two remarkable actors with stunning good looks play the lead roles. Knightley is mesmerizing to watch. As Rachael, she is more than the grieving mother and her stunning good looks, charm and demure sexuality give her character the classic characteristics of a femme fatale. Skarsgard’s charm, sensitivity and masculinity illuminates his role and heightens his vulnerability as the grieving widower, dispossessed man of stature, and father of a disturbed teenager. Why wouldn’t Rachael and Stefan be drawn to each other living in close quarters in spite of their enmity? Despite everything, it’s a story of two people starved for and in need of a little tenderness and love, and the film delivers in spades. The film, I found, engages one’s emotions on many levels in particular emotionally and intellectually. Rachael’s flashbacks are beautifully crafted evoking the anguish and despair of a grieving mother. The egregious, insulting and demeaning bias of the British towards the Germans weaves itself through the film casting aspersions on their moral authority. Are all Germans to blame for the atrocities committed by the Nazi state? Kudos to the director for bringing to cinematic light a film that captures a complex reality and relationship between victor and vanquished and its aftermath. The director has woven together many visual elements to create a fascinating and intriguing film set against the devastation of the Second World War where grief and enmity meets passion and betrayal in a charged atmosphere of ‘death and destruction’, and ‘revenge and redemption’. 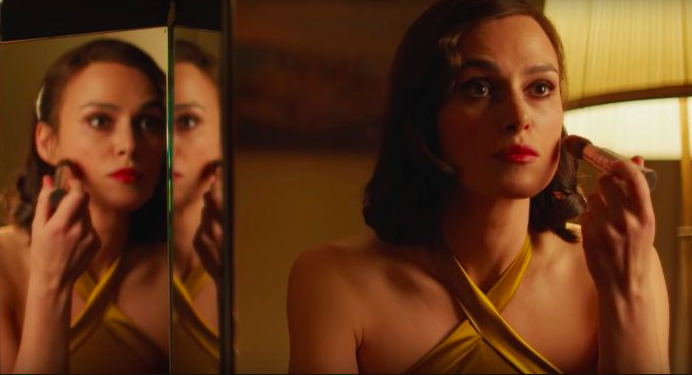 Knightley gives a compelling and powerful performance as the neglected wife, playing second fiddle to the war, and the grief-stricken mother. She is beautifully directed and shot, and brings a gravitas and vulnerability to her role that is bitter-sweet and heartbreaking. Her performance is nuanced, complex and multi-faceted rendering a sympathetic character. The scene she shares with Freda and Stefan at the piano will have you reach for kleenex tissue and perhaps, shedding a tear or two for their desperation. If you enjoy melodramas or love period pieces, or a fan of Keira Knightley and Alexander Skarsgard do see the film. You won’t be disappointed. There is much to recommend it!